Simply put, the Flint Hills Rodeo started in a Chase County pasture. Having an impromptu rodeo in a pasture in ranch country was a fairly common practice several decades ago. But to start a rodeo and keep it going, that is an accomplishment. Making that rodeo bigger and better over the years, this is uncommon. For this reason, we consider the details of how the Flint Hills Rodeo was born and raised to be a worthwhile story to tell. If this was only a simple two-bit show, the story may be less than interesting. But the Flint Hills Rodeo started as the "home court" of the E.C. Roberts family of Strong City, a clan with half of the kids winning world championships in rodeo. 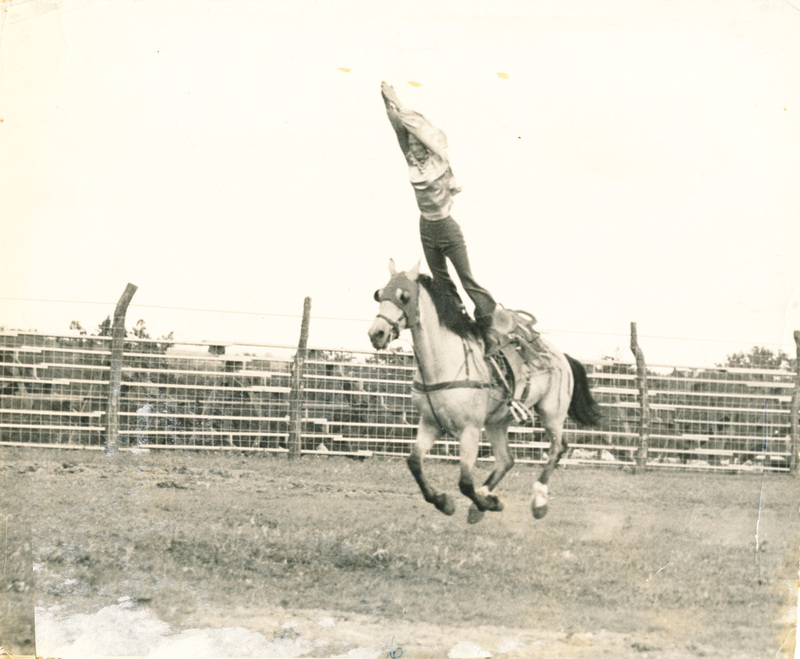 Red Dougherty, a former competitor, calls the Flint Hills Rodeo a who's who of rodeo. The Flint Hills also is the oldest consecutive rodeo in Kansas. These distinctions are surprising when you consider what the Flint Hills Rodeo has ridden through. When Wally Evans of Emporia spoke of the rodeo's early days, he often used the term, "cobbled together." Evans was the last of the original Flint Hills Rodeo board of directors. But cobbled together as it may have been, the event quickly took shape and attracted professional cowboys from other states to compete in time for its second annual event in 1939 and each year ever since. The Flint Hills Rodeo had the Cowboy Turtle Association's stamp of approval in the early years, followed by the Rodeo Cowboys Association's blessing, and in the most recent years, the PRCA - the Professional Rodeo Cowboy Association's endorsement. The Flint Hills Rodeo is still at home in Chase County, in the cattle country of the Kansas Flint Hills. This area's living history is seen in herds of cattle grazing on the hills' bluestem grass. Bluestem thrives in thin soil where stone is often just below its root system. This grass has ties with the Flint Hills Rodeo since each has found a way to thrive in spite of its situation. Bluestem grows well in thin, rocky soil. The Flint Hills Rodeo prospers with even though its roots are traced to beginning in the Great Depression, counting on lots of volunteer help, continuing through wars and weathering tough times in the cattle business. This rodeo is a tried and true treasure which is put on each year, rain or shine. The story of the Flint Hills Rodeo is what I call a braided tale. The Roberts family, community people, local ranching, the Rodeo board, and the Flint Hills themselves are woven often seamlessly into its history. Additional plaits in the braid are weather, the parade, rodeo cowboys and cowgirls, and the stock. Gerald Roberts said he was the first to use a nine plait braid in a rope for bull riding. Nine plaits make for a sturdy rope that can be counted on when riding a huge, unpredictable bull into the rodeo arena. In the same way, the Flint Hills Rodeo has ridden through the best of times and the worst of times using a strong braid of several assets. Cobbled together at first, maybe. Tried and true over seventy years, without a doubt. The Flint Hills Rodeo began from a regular practice in the 1930's of staging pasture rodeos at the farm of Emmett Roberts near Strong City, Kansas. 1937 is marked as the birth year of the Flint Hills Rodeo. 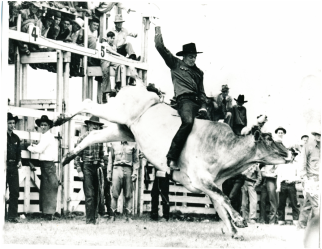 It was only a natural step when Roberts along with his son Ken Roberts and his son-in-law Eddie Boysen put on what they called the First Annual Chase County Rodeo in 1938. The rodeo they hosted was renamed the Flint Hills Rodeo the following year and has kept going without fail ever since. Today, the Flint Hills Rodeo holds the distinction of being the oldest consecutive rodeo in Kansas. The first full weekend of June finds the rodeo convening in Strong City, using the same arena and grounds built for the event back in 1948. Marge Roberts was born in 1916 to Emmett and Clara. The first child in the family. I'm sure no one dreamed this tiny little bundle was destined to lead her Dad and two brothers into the pro rodeo arena. Emmett placed her on a horse as soon as she could sit well. She loved the "ponies" and she and they soon learned how to act as a unit. When she was 13, she went with the Clyde Miller Wild West Show during the summer. Upon graduation, she joined the show full time, where she was later joined by Ken and Gerald. She married Eddie Boysen and they began producing some rodeos, in addition to their performing. Marge's bronc riding was spectacular. She was real showy, whooping and hollering every time the bronc hit the ground. According to historian Don Bell, Marge won the women's bronc riding at Cheyenne, the equivalent of a world's champion, in 1940. At that point in time world championship titles were not awarded. Besides bronc riding, Marge also had a trained horse act and did exhibition trick riding. First Kansas cowboy to become ALL AROUND CHAMPION cowboy of the world in 1942 and again in 1948. Only cowboy in the world to win championship as a member of the Turtle Association and again as a member of the RCA. Gerald Roberts was born in Council Grove, Kansas, October 5, 1920. He moved to Strong City when a small child and attended grade and high school here. He could ride a horse before he could walk. He, Marge and Ken used to amuse the neighborhood by having rodeos in their backyard. "Dad used to buy young colts by the carload, Ken, Marge and I used to break them while riding to school. I guess that is how we really learned to ride." In his first 14 years of rodeo he accumulated 10 saddles and 40 belt buckles. More information about Gerald is available at www.GeraldRoberts.com. Born January 22, in 1918 in Council Grove, Kansas - Died September 12, 1975 in Strong City. Ken, like his brother and sister grew up around cattle and horses. He was always giving credit to Marge as being his toughest competition and credited her with leading him and Gerald into pro rodeo. To be a world champion you have to enter as many rodeos as possible, and to score the highest possible points as often as you can. The animal you draw has much to do with it. A bull will try to stomp you or horn you when he throws you. A horse will usually try to jump over you. Ken learned to ride bulls by doing just that. The story is told about him learning to ride a specially ornery bull. Every day for a over a week that bull threw him. Several times he was unconscious. He finally figured the secret of guessing which way the bull was going to move by sensing his muscle movement. Ken said one of the disadvantages of rodeoing is the inability of the performers to get adequate insurance. To honor this rodeo family who founded the rodeo in Strong City, a six by twenty foot mural was erected and dedicated on the Flint Hills Rodeo grounds in June of 1994. The mural features the paintings by local artists; Dena Kleinsorge, Peggy Lyon, Audrey Murrell and Debbie Schroer. These paintings have been moved in order to protect them from the elements and can now be viewed on the back wall of the east ticket booth.